Secluded with great mountain views! Moonshine Manor is your chance to come and enjoy the real Smoky Mountains. This cabin is situated on the top of a mountain that overlooks the Great Smoky Mountain National Park on 10 private acres of paradise. You can enjoy a crackling fire in the fire pit while taking in the magnificent views of the Smokies, or soak in the hot tub and take in the peace and relaxation of the mountains while watching the birds soar across the Smoky Mountain Range in the distance. The cabin is conveniently located in Cosby "The quiet side of the Smokies" minutes from Newport, I-40 and approximately 25 minutes from Gatlinburg and Pigeon Forge. All your needed amenities can be obtained at either locations. You will love to explore the property and picnic under the trees, hike to the old burnt down cabin on the property where you can only imagine what took place and the memories that were obtained from such a magnificent location, play in the backyard where the yard is massive and you never have to worry about anything. Skiing is only 45 minutes away and in the summer river rafting, kayaking and tubing are both only 20 minutes away. Or how about the entrance to the Great Smoky National Park only 10 minutes away. The surrounding area is full of wildlife, waterfalls, hiking trails and the like. If you want to escape it all and still have the local attractions at your doorstep this is the place for you and your family. Moonshine Manor can accommodate up to 7 guests. There are 2 bedrooms 1 bath, 2 queen size beds, pull out sofa and a hide a bed. This spacious cabin has an open floor plan and decorated a simple country charm that will create a lifetime of memories. We love our cabin as it is a family retreat and would like to share it with you. 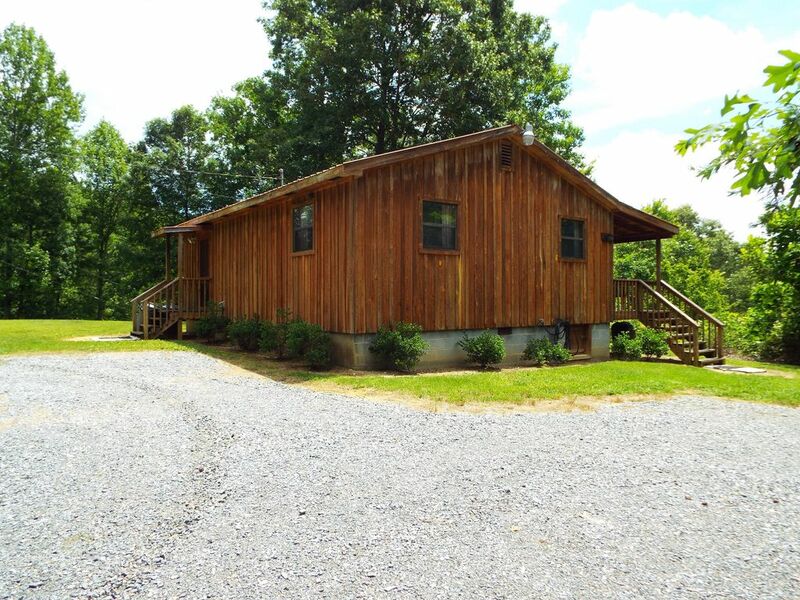 The cabin is conveniently located next to Newport, TN and downtown Cosby. All your needed amenities can be obtained at either location. We are also only about a 25 minute drive to Gatlinburg and Pigeon Forge. We love to explore the property and play in the stream in the valley while having a picnic under the trees, we love to walk to the old burnt down cabin on our property where you can only imagine what took place and the memories that were obtained from such a magnificent location, we love to play in the backyard where the yard is massive and you never have to worry about anything. Did I mention that skiing is only 45 minutes away and in the summer kayaking and tubing are both only 20 minutes away? Or how about the entrance to the Great Smoky National Park only 10 minutes away. The surrounding area is full of wildlife, waterfalls, hiking trails and the like. If you want to escape it all and still have the local attractions at your doorstep this is the place for you and your family. Secluded! 10 acres of privacy with private drive. Amazing views of the Smoky Mountains from the deck of the cabin with bubbling hot tub calling your name! The view from the hot tub is great, it overlooks the smokey mountain national park. was our first time visiting the Gatlinburg area and wanted to find somewhere we could stay with the dogs. Loved it! The cabin was amazing and far enough away from attractions to enjoy nature but not too far where you can get to somewhere if you absolutely needed to! There is a steep incline getting to the cabin itself that can be scary getting to for the first time but you get used to it quickly. Enjoyed the hospitality of the property managers and will definitely be staying there again. Cozy cabin perfect for a getaway. This is a great cabin stocked with all the basics (in the kitchen, extra bedding) as well as movies, games, books and coloring books. The front deck was our favorite place to be with the hot tub, rocking chairs and swing, overlooking the mountains. When not on the deck we were often at the table playing games. There were detailed instructions on how to use the tv and various media equipment. We didn’t use them much, but very helpful! I will mention though that the sofa bed mattress is not comfortable. I have 3 kids and none of them were willing to sleep on it. They took turns on the couches and the 2nd bedroom bed. Firewood was delivered to our fire pit promptly and the gentleman even took a family photo for us. Anytime I called Cramer’s Creekside Cabins they were kind and helpful. I knocked my review down to 4 stars because we were farther from Gatlinbug and Pigeon Forge than we would have liked. The description says 25 mins from each yet our GPS maps took us routes that averaged 40+ minutes. The description also says 10 mins from the National Park which may be true, but we had no information on which entrance to the park that would be, nor how to get there. Again, when entering the park on our GPS it took us into Gatlinburg 40+ mins away. The other minor inconvenience was the lack of cellular service and WIFI. Perfect for people who are trying to leave the hectic world behind, however I really would have appreciated WIFI in order to download my photos to my electronic devices. I thought I could do this while in town, but I was unable to do that successfully. The lack of WIFI also made planning our day trips harder because we couldn’t access our GPS maps or google information on the attractions/parks we were planning on visiting. This was a big issue on the day we had planned on hiking with our dog in the national park. We didn’t know which trails were dog friendly or what trails were at what entrances to the parks, etc. The lack of WIFI and cellular service was inconvenient and had I been more aware of this prior to our trip, we would have made sure we had done more research ahead of time and brought extra memory cards for my camera. Our family was looking for a laid back, dog friendly vacation in the mountains and this cabin certainly met those requirements. Thank you for sharing your cabin with us. We made a lot of wonderful memories there. We were there 4 nights and 5 days. I wish we could have stayed longer! Couldn't have asked for more ! It was so relaxing and we had 2 days of snow, beautiful view and Jim (prop mgr) was a wealth of info for good places to eat. Thanks again for a wonderful time we will be back again. What a great place to just relax and get away from "it all". Nothing was missed in providing for our stay. The owners have thought of everything. The view from the hot tub was beautiful and the night sky has never been more inspiring. The location was great too. Very easy to get to and so close to interstate. The drive to Gatlinburg was oh so easy. My fiancee and I stayed here for 8 nights, and when you work with people all day, every day, this is the EXACT getaway you need. We sat on the porch (and of course in the hot tub) watching the birds at their feeders, and a couple times, clouds roll in over the mountains. We went to Clingman's Dome, which has a ton of spots for hikes along the way and is a great day trip. If you go anywhere to experience the mountains, go there. The cabin was clean and it was great to be able to cook dinners every night together, the hubby on the grill while I manned the stove, hard to do at a hectic house like ours. I will say, if you have a bigger vehicle, (I have an F350 with extended bed and dualies) if it's been raining put it in 4wheel drive to go up the driveway(some moss builds up in the driveway), and don't be scared to drive down a hill and k-turn. Would be perfectly fine though in a regular sized vehicle up or down, made me miss my grand cherokee! Thank you for everything, and when we are looking at real estate, we will be using your cabin as home base! Carver's Apple House is always a great treat and don't forget about whitewater rafting in the Pigeon River. Many hiking trails with minutes of the cabin.